Rainwater Collection — H. W. Schwope & Sons, Inc.
Rainwater storage tanks are a great way to get ahead of the droughts in the drought-prone Hill Country. Rainwater tanks offer many benefits from reduction of sediments, iron, and minerals, to aerating any odors that may come from sulfur in the water. 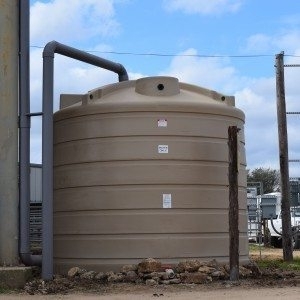 Further, having a 2500 gallon+ storage tank, provides days of water storage for a typical family in the event of a power outage or downhole pump failure. Increased water pressure and volume is also an advantage if your water well is a low producing well. All of our tanks do not allow light inside which allows the growth of algae. Having a storage tank can also get you a break on your home owner's insurance by having additional water available in the event of a fire.